Successfully Added GPS Receiver + Data Logger + Photo Tagger + Distance Monitor to your Shopping Cart. Mini Global GPS 5-in-1 device. This amazingly cool gadget is an all-in-one GPS Receiver, Data Logger, Location Finder, Acceleration/Distance Monitor, and UTC Clock! Waterproof and compact design with a 1.5 inch display mean it's the perfect little tech gadget for active lifestyles or even everyday business use! 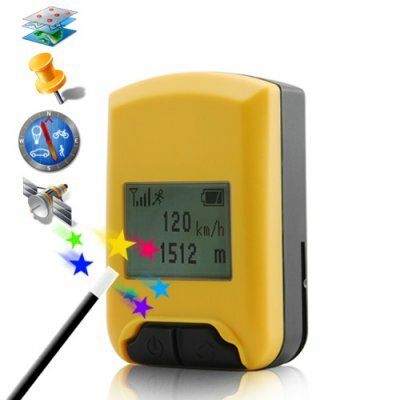 GPS Receiver: If you enjoy outdoor sports and recreation such as hiking, biking, skiing, mountaineering, or wilderness photography, this incredible gadget co-ordinates with overhead orbiting satellites to give you instant position data like longitude, latitude, attitude, and velocity. You can also single-click record P.O.I. (points of interest) data to download to your computer when you get home. It even retrieves satellite verified UTC time. Data Logger - Capture and log your exact position whenever you need it. This incredible gadget can save 125,000 data points and can even output this information as Google Earth ready KML files. On a professional level, this is perfect for route logistics optimization as it can automatically record data points specified by time or distance. Recreationally, this device is ideal for walking, biking, or car/bus tours. Take it with you on your next vacation! Photo Tagger - Imagine you've spent the last 2 days making your way through the Brazilian Rain forest. You've logged more than 2000 individual waypoints on this device. At the same time, you've taken photos at each and everyone one of those locations. Simply attach this deluxe GPS deluxe to your laptop, run the included software, and easily synchronize your photos with their exact GPS location. Distance Monitor - If you know that old fishing spot you and your uncle used to go to is 9 miles east of the highway, then with this device if you see that you have traveled 12 miles, then you know you missed it and its time to turn around and turn left instead of right! This new Mini Global GPS 5-in-1 device is for everyone wanting to see where they are going when outdoors and also record their activities to review later when they get home. A truly great GPS Gadget with versatile usage and a low factory wholesale price make this a "must have" Cool Gadget for anyone, including friends or family members, as well as a very nice gift to give to your boyfriend/girlfriend. It's in stock now for single piece or bulk stock purchases. So don't wait, click "add to cart" right now and we will express ship it out to you tomorrow. The deluxe GPS device can also be used as a GPS receiver for your PC. Simply attach it to your computer with the included USB cable and run the included software. Uses readily available AAA batteries as a power source. This is handy when you're outdoors and aren't able to recharge the unit! why would I buy this Mini Global GPS 5-in-1 Device over others one I've seen? Of all the many features this GPS gadget has, two come to mind as outstanding. The first is, the LCD display. Instant visual communication of important information like your exact point on Earth. Also, if you've ever used a GPS device without a display, the thought of saving thousands of waypoints while you're traveling with no visual proof that it's being saved is an anxiety-filled experience. With the CS38, you log a data point. You have immediate visual confirmation that it's done. Also many of you asked us for a GPS device that ran on normal store bought batteries. Your reasoning? Because out in the wild, it's hard to recharge things, but it's easy to carry along spare Duracell or Energizer batteries. We listened. How is this model different from CVHN-G50? The CS38 incorporates the strongest features from the CVHN-G50 and adds a display screen and support for non-rechargeable batteries based on customer feedback. The included software is extremely user-friendly and easy to use. Every one of its great functions requires just one click of your mouse. Plus, it's free! And if you find yourself really getting into geo-tagging photos, you can find many outdoor recreation forums and hobby groups on Facebook that can recommend even more powerful commercial software to do even more powerful things with your recorded GPS data.